Overgrown shrubs and hedges look unsightly — even if you maintain the lushest lawn on the block in a yard full of healthy trees and vibrant landscaping. 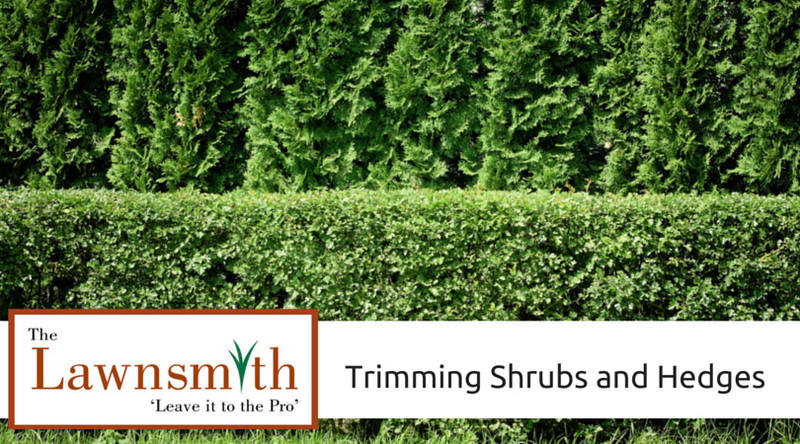 Trimming shrubs and hedges is a commonly overlooked task. But doing so once or twice every season will allow more air and sunlight in, maximizing growth and reducing the likelihood of fungus and other diseases developing. Think of the task as preventive maintenance. Depending on the form and type of the plant, remove dead or damaged branches with loppers or shears first. Leave smooth and clean cuts at a 45-degree angle, which will allow rainwater to slide off rather than gather and invite fungus. Electric shearing or trimming works well for hedges, while pines and evergreens with needles require a small hand pruner or lopper. Unless you want to turn your hedges and shrubs into unusual or ornamental art forms — for that, we recommend you hire a professional, such as The Lawnsmith— you should opt for a natural look with a uniform height. Trim branches beginning with the tallest ones and aligning them with shorter branches until you reach the overall desired height. It will be helpful to step back and take a look at your work every so often to ensure you’re maintaining a consistent shape and height. Remember that every new cut encourages new growth. So be sure to thin out the sides (and not just trim the top branches). Keep the shrub or hedge wider at the base than at the top, which will let in sunlight and foster healthy growth. Given the climate in Minnesota, the University of Minnesota Extension office recommends trimming shrubs and hedges whenever growth reaches another six to eight inches, and pruning to within two inches of the last trim.